For our youngest children, art is an opportunity to express themselves in a creative way! 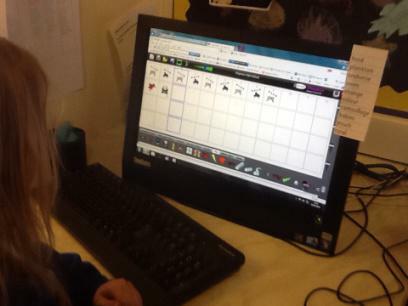 We set up our classrooms so that children can access a range of art/craft resources independently, so they can choose what they want to make, decide how to make it and gather the things they need for themselves. Painting and drawing are popular with the children as they are beginning to represent in their pictures or they might just enjoy exploring the texture and feel of paint on their fingers as they move it around on paper, mixing colours. Some children like to make models using a range of ‘junk’ materials (parents provide a steady supply of boxes, cartons, yogurt pots, plastic lids and so on, and the children can use their imagination to turn these into police cars, houses, rocket ships and so on. Some children just enjoy the experience of using glue and tape to fix things together and will proudly carry their creations home! Children have opportunities to draw from observation, including self-portraits and natural objects like flowers or shells. They also have opportunities to mix desired colours themselves, having been taught the technique and gradually refine their marks and movements on paper as their maturity, fine-motor control and confidence grow! Art skills are built up from early experiences of painting, drawing and so on in the early years. Children are introduced to famous works of art by Monet, Van Gogh, Matisse, Kandinsky etc and often use these works to represent their own ideas in a particular style. Children are introduced to a variety of techniques and media – charcoal, pastels, printing inks and rollers as well as clay, papier-mache and sewing. A lot of our school Building Learning Power characteristics are taught through art (to learn perseverance, what better way than to sew or weave?!) as well as questioning, noticing and collaboration skills. We learn the skills of appreciation when looking at art and sculpture, who made it, what is it made of, how does it make you feel? All of our children love to engage with art activities as it gives them an opportunity to express themselves. Art can be a chance for all children to shine, to represent their own world and to explore their feelings. Alongside Art, we also value other creative opportunities like music (singing songs and rhymes and exploring musical instruments), dance and drama. Music is taught as a fun, practical, sociable and creative art to be enjoyed by all! We enjoy a weekly singing assembly where we learn and sing a wide variety of songs. We are members of Sing Up, an organisation that believes singing improves learning, confidence, health and social development. Music forms a big part of seasonal performances such as Harvest Festival, Christmas and Year 2 Leavers Concert. In the foundation stage, children enjoy singing lots of action songs, nursery rhymes and singing games to develop their musical skills and to aid learning in other curriculum areas, for example number songs in maths. Children are encouraged to explore, listen to and create a variety of sounds. They are introduced to a range of tuned and untuned percussion instruments to explore making sounds through tapping, banging and shaking. They learn to tap repeated rhythms and explore how sounds can be changed. 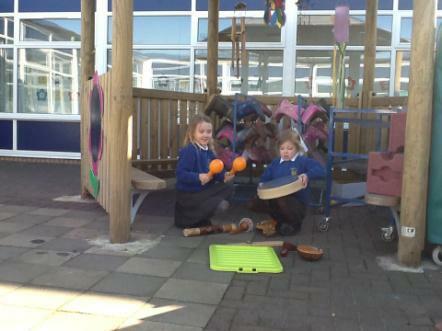 Children explore different ways to move to music and enjoy listening and responding to music indoors and outdoors. During Key Stage One children build upon these experiences and develop their skills of performing, composing, listening and appraising. Children learn to sing a variety of songs from memory, sometimes adding accompaniments. They use tuned and untuned instruments to explore how sounds and silence can create different effects. They learn how to control sounds made with their voices and instruments. They explore and express ideas about music through movement and dance.